The fronds that will form the early placenta can be clearly seen on the right here. 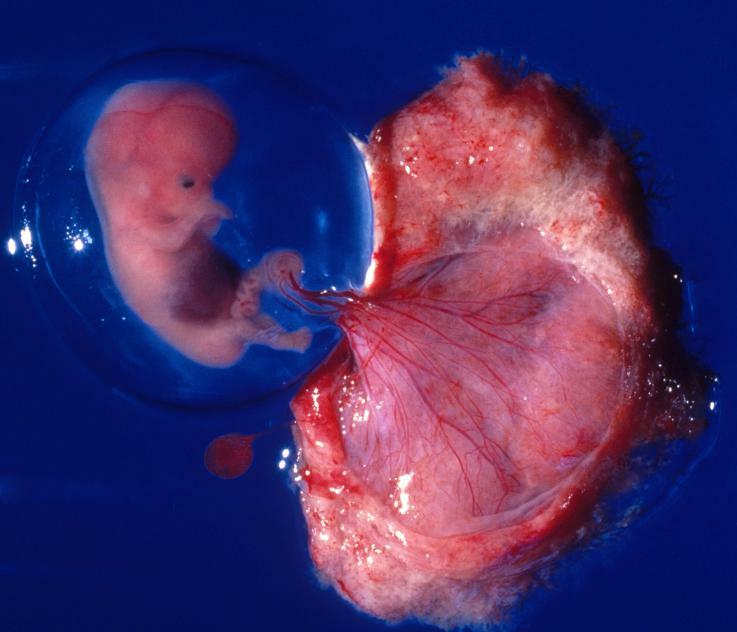 At the bottom and separate from the embryo is the yolk sac, which is becoming ever smaller as its role is taken over by the placenta. As your body begins to change shape, you may start to worry about gaining too much weight. You’re supposed to put on weight during pregnancy and while this is not a time to overeat, neither is it a time for faddy or restrictive diets. By eating sensibly and exercising moderately, you should gain a healthy amount of weight during pregnancy. How much weight you should gain depends on your starting weight. If you are underweight when you become pregnant, you should put on more weight than someone who’s overweight. This starting weight is calculated by working out your BMI, which is a measure of weight in relation to height. It’s a useful tool to work out approximately how much weight you should gain during your pregnancy. If your BMI falls within the normal range, then your recommended pregnancy weight gain is 11–14.5kg (25–32lb). If your BMI is in the underweight category, you should gain 12.5–18kg (27.5–40lb). If you’re overweight, your pregnancy weight gain should be 7–11kg (15–25lb). Women in the obese category should gain approximately 7kg (15lb). Women carrying twins should plan to gain about 16–20kg (35–44lb). As a rough guide, an ideal weight gain is no more than 2.2kg (5lb) in the first trimester; no more than 5.5–9kg (12–20lb) in the second trimester; and no more than 3.5–5kg (8–11lb) in the third trimester. Remember not all of this weight gain is fat. Over the 40 weeks of pregnancy, you are likely to gain very little weight in the first trimester and then experience a steady weight gain of around 750g–1kg (1.5–2lb) a week. In the final few weeks of pregnancy, it’s normal to gain a few more pounds. Remember that all figures given are averages and the amount you gain will depend on many individual factors; where weight is gained can also differ from woman to woman. Always consult your midwife or doctor if you’re concerned about any aspect of your weight gain or diet. The weight you’ll gain during pregnancy is a combination of your baby and her support system, the increased size of your breasts and uterus, essential fat stores, and additional bodily fluids and blood.